Jumble Puzzle is a game where you have a 24 tiles in a 5x5 grid. The tiles are numbered from 1 to 24. The object of the game is the number the tiles in order by moving the tiles around, keeping in mind that you can only move a tile into the blank spot on the board. 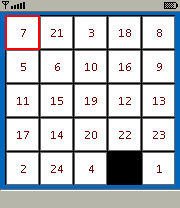 I have a Java applet version of the game here you can test in your webbrowser: http://www.mikekohn.net/java/jumblepuzzle/. For a more modern version of this game for check my Android / iOS page. Jan 6, 2006 Bugfix: Before it was possible that the board could be scrambled in such a way that it was unsolvable. Now it's fixed. You can use 2,4,6,8 or the joystick pad on your phone if you have one to move the red marker around. To move a tile press the okay button on your phone or the number 5. If you've select a tile you're allowed to move, it will move into the blank area. To win the game, the upper left corner should be the blank spot and the rest of the tiles should count from left to right. At the bottom right corner should be the tile labled "24". To exit the game, you may have to hold down the back button on your phone.